Scientists are within about 8 years of making two of the most disruptive discoveries in human history. The question “Are we, as an island of life, alone in the universe?” – is on the brink of getting a definitive answer, using a series of dramatic “business model” and technology innovations. Even the question of whether intelligent civilizations exist beyond Earth now has a serious chance of an answer, thanks to the same disruptive technique. And it is telling that the approach being used by NASA, MIT and others to solve this iconic problem is similar to the model used by top executives to disrupt commercial markets – a combination of cross-functional collaboration, problem-solving creativity, big data analysis, and status-quo rebellion, conducted by youthful change-agents who profit from failure. Innovative astronomers have turned a seemingly impossible problem literally 180 degrees around, and have come up with an approach and a technology which is dramatically simpler, cheaper and more goal-driven: the precise recipe which has driven game-changing growth at Amazon and Uber. Rather than embarking on the massively expensive and complex model of going in search of extra terrestrial life, they have innovated a method called “spectral biomarkers” which lets data about life come to them, literally at the speed of light. Meanwhile, their grand effort also hints at a way forward for business: in mobilizing the leadership of female innovators, and using incremental innovations to achieve a clearly defined disruptive goal. Scientific giants like Newton, Maxwell, Einstein and Crick were able to shift paradigms of understanding in ways which triggered whole new branches of science – creating, in other words, “new markets” for knowledge in the same way that companies like Apple and Amazon have done in the commercial world. Many of their successful models also gave rise to new technologies, which, in turn, produced commercial innovations. But they were truly “disruptive innovations” in the sense described by Clay Christensen, in that they created new markets while destroying rival models. Christensen suggests that “efficiency innovation” – which produce the same products more cheaply, such as such as Geiko’s insurance model - is driven by revenue and competition, in that it pays off quickly and produces profit. And he suggests that “sustaining innovations” – replacing products with better products, like the iPhone and the Prius – generates moderate revenue returns without creating new demand. Since profit on the balance sheet is the goal in both cases, there are limited lessons in which executives can learn from great scientific innovations. By contrast, Christensen says disruptive innovation involves longer term problem solving and investment – outgoing capital – in a bid to create new markets, by making whole categories of products simpler, accessible, or more affordable for consumers. Isaac Newton was frustrated, on behalf of all scientists, that the accepted model of the solar system could not explain Mercury’s strange orbit around the sun. So he innovated a tool – calculus – to solve it, and in so doing, unwittingly created whole new markets of inquiry. It seemed crazy to Henry Ford that middle class Americans could not afford an automobile; it seemed crazy to Steve Jobs that people could not have a 1000 songs in their pocket; and it seemed crazy to Elon Musk that the cost of getting to space was the same now as it was in the 1960s. The project to prove the existence of life off the earth will likely represent the next leap in human knowledge, to follow the mapping of the human genome, and the discovery of the fate of the universe. Knowing that it would take the fastest space ship at least 100 000 years to reach the nearest extra-solar planets, many research institutions abandoned the problem as hopeless. In addition, the primary method of identifying exoplanets – by measuring their gravitational “tug” on their host stars – could tell nothing more about those planets, except their size and their orbits. There was a less efficient method of identifying planets – by measuring the degree to which a host star ‘s light is dimmed, as that planet passed across its face in eclipse. But a group of innovative astronomers – primarily, innovative women scientists – realized that this technique could allow information from those planets to come to us. Beams of starlight could collect information about a planet as they move through the atmosphere of a passing planet. But could that information prove life exists there? Professor Lisa Kaltenegger, of Cornell University, is one of the pioneers of the “spectral biosignatures” method which now seems set to make two of the greatest discoveries in history: proof that life exists elsewhere, and even proof that intelligent civilizations exist elsewhere. The youthful, Austrian-born astronomer is an unconventional thinker and disruptive innovator. Like the best commercial innovators, Kaltenegger – then in her early 30s – turned the distant life problem completely around. In an interview, she told me that she had once wondered whether an alien civilization could determine that there was life on Earth, simply by examining our atmosphere in their telescopes. Kaltenegger then turned herself into an alien scientist - using instruments on an orbiting satellite to actually examine Earth’s atmosphere for any unique evidence that the planet was home to life. She and her colleagues came up with a recipe of evidence, which features a combination of gases which could only balance each other through the processes of life: large amounts of ozone, methane and nitrous oxide. So the next question became: how do we find those three “biosignatures” on alien worlds – among the list of some 4400 “exoplanets” which have so far been identified outside of our solar system. I remember thinking: this is surely the kind of visualization and passion that a young Steve Jobs brought to the problem of how customers experience music. The research group which Kaltenegger now heads at Cornell even has a Silicon Valley-type name: The Institute for Pale Blue Dots. South Africa’s Professor Neil Turok – the former chief collaborator with Britain’s iconic physicist Stephen Hawking – told me in an interview that the admission of Jewish students to science faculties in Europe in the late 19th century was a disruptive influence in physics, which led to leaps in discovery and technology. Partly based on his conviction about the disruptive impact of new groups to discovery and innovation, Turok has since launched the Next Einstein Initiative – to identify and develop game-changing talents in Africa. Likewise, the Business Performance Innovation Network suggests here that the admission of women scientists to the field of astronomy triggered a disruptive step-change in discovery – and that the discovery of life beyond our planet will be a direct product of the influence of female innovators in the field. In the late 19th century, astronomy – then, a male-only field of science - had stagnated. It was then understood that stars were made of iron, and that the Milky Way Galaxy represented the entire universe. The sudden admission of female astronomers, en masse, revolutionized this picture. Within two decades, a Harvard-based astronomer – Henrietta Leavitt – had provided the first measuring tool for the universe, which proved that ours was simply one among billions of galaxies, while Cecilia Payne, from the UK, had proved that stars were made of hydrogen. In 1879, Edward Pickering head of the Harvard Observatory – triggered the revolution which continues to this day, by hiring his housekeeper, Williamina Fleming, to tackle a problem which his male graduate students had failed to solve – how to catalogue “variable stars”, like the North Star. Fleming not only found over 300 variable stars, but was the first to create a classification system for all stars. Jump-Cannon’s work in the 1890s is the basic tool which is now being used in the grand search for life – and any Google search of the technique reveals that modern female astronomers are dominating that effort. 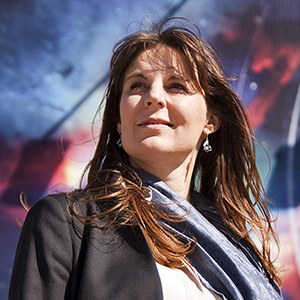 Astronomy provides the clearest evidence that an influx of women innovators can change the game across an entire field – and the likely discovery of life beyond earth will surely act as a global catalyst for women innovators in all fields. Everyone now understands what Isaac Newton first discovered: that white light is made of the full rainbow of colors, as can be seen when a flashlight beam hits a glass prism. But there is far more information than colors hidden within starlight. Spread out by modern instruments, the light from each star is packed with a unique pattern of black “absorption” lines, from where photons from that star have scattered off elements like sodium and carbon in the star’s atmosphere. Scientists like Kaltenegger, and Professor Sara Seager at MIT then wondered: what would happen when the light fingerprint from a distant star passed through the atmosphere of one of its planets. The answer was that the starlight “fingerprint” would gain additional absorption lines. And so the great discovery of our time will hinge on this: whether we can find starlight which gains those little black lines for ozone, methane and nitrous oxide, after it passes through the atmosphere of its planet. Even more remarkably: there are now serious proposals which state that alien civilizations can be shown to exist, using the same technique to look for smog and other industrial pollutants in the atmospheres of distant planets. Such a discovery would be disruptive even to major religions. While Kaltegger and her colleagues had solved the conceptual problem of proving life elsewhere, major technical problems remained – in terms of finding the planets against the overwhelming glare of their host stars, and then finding a beam of starlight which sliced through the atmosphere of such a planet. In one of the most successful science collaborations of all time, the Kepler project has identified thousands of planets – including a handful of “earth-like planets” – orbiting distant stars. These planets are far too distant to provide any signs of life – but the experimentation process in finding them has now paved the way for an effort to identify “nearby” planets, where life could be detected. A new satellite called TESS – built in a collaboration between NASA, MIT and others - will be launched in 2017, which will scan the heavens for nearby planets which orbit their stars in a such a way that starlight passes through their atmospheres before arriving at our telescopes. A year later – 2018 - a new space-based instrument called the James Webb telescope will use an advanced spectrometer instrument to examine the “polluted starlight” from TESS planets for singes of the biosignature gases. To date, astrobologists have examined asteroids and the Mars surface for trace or fossilized evidence of life, largely in search of tiny “extremophile” organisms. By contrast, the biomarker method is designed to reveal worlds that are brimming with life – as such planets would need trillions of plants and creatures to have exhaled or processed the gases which have transformed those atmospheres. She would be delighted to find evidence of somewhat less glamorous life forms among the stars – like algae and bacteria, but she says that the question of whether we are alone in the universe could very well be answered within a decade.